Well OK, it’s down, but it’s still a bit dusty. I have a little clean up work to do. Earlier this year, I was in Salt Lake City and had a chance to visit the Family History Library. I had not planned the visit, wasn’t really going to spend too much time researching, but since some other GeneaBloggers were there, I went over too. Today, I received a long awaited letter with source material that was behind the Pedigree Charts that I talked about in the Evidentia series. I had seen a code ITEM PR2 listed several times in the various documents I have seen over the years, but didn’t have a cross reference to what that was. Actually, I did have it in my archives, in about 500 pages of reference material. In the Item PR2 (Parish Record #2) was this bit of information. References “English Parish Records: Lancashire (Salford & West Derby Hundreds), Cheshire, Flintshire” – CD produced by Ancestry.com “from parish records and similar sources” for all 1600-1615 details, “The Registers of the Cathedral Church of Manchester, 1573-1653”, Lancashire Parish Register Society (LPRS), Volume 31, for all 1616-1653 details and “International Genealogical Index” (IGI), Batches P005461 and C005462 (Baptisms 1654-1699) and Batch M005462 (Marriages 1665-1699). 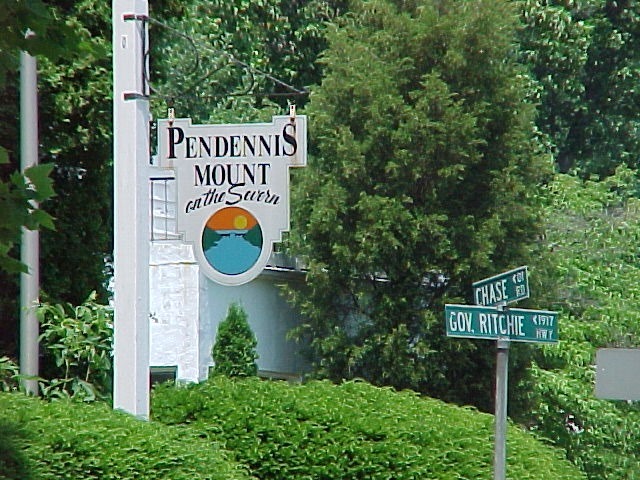 It wasn’t the same location in England, but I wondered IF the information in Item PR2 was also online. Well it was. 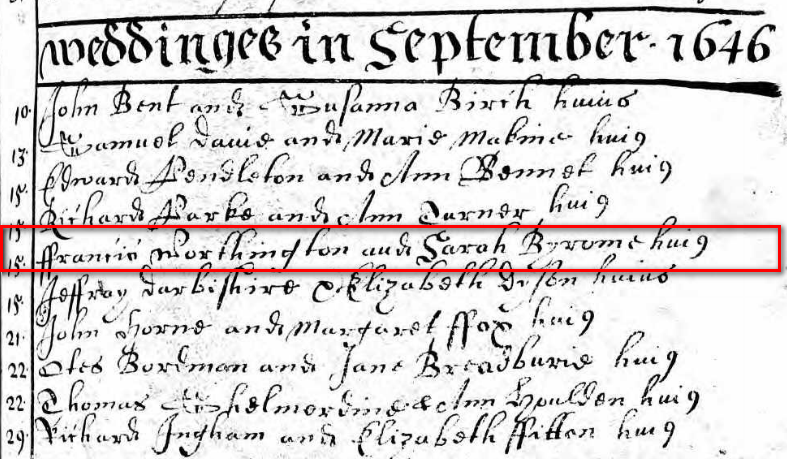 Here is the parish register entry for Francis Worthington and Sarah Byrom(e)’s wedding. Not stopping here, because in the notes for “Item PR2” was this. This is going to be interesting. But clearly, the author of this article, Stuart G Worthington, had done his homework and has shared that with other Worthington researchers. Can’t wait to get this new information into Evidentia. But, I still had an issue. Collegiate Church, Manchester, Lancashire, England, and the name of the church in the Ancestry.com website of St Mary, St Denys and St George, Manchester, Lancashire, England. So, I did a google search for St Mary, St Denys and St George and found this website. Oh, the PR2 had about 75 Worthington Baptisms between 1600 and 1699, similar number of Marriages between 1600 and 1699 (excluding 1654-1664) and Burials between 1600 and 1653). Almost 4 pages of typed names. No wonder I couldn’t determine who Capt John’s parents were. 4 pages of Worthington’s had an event that took place in the 17th century. 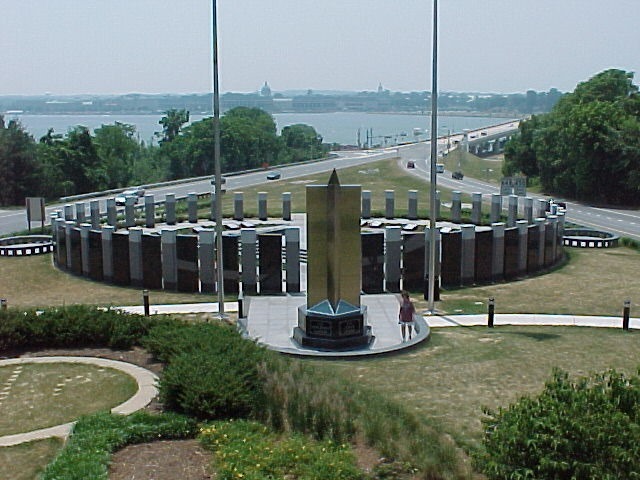 In the Frederick Adams Virkus, Immigrant Ancestors2, it mentioned a brother, Samuel Worthington, that arrived with Capt John to Maryland. I have not found him or anyone close to him in the records. Still looking for that one. I posted Where do I Start? and thought I would follow up on that post. Actually, the report really helped. I stayed focused on that list and did an online search at Ancestry.com. I worked on the first 16 people on my list (males), and actually found 4 records in an Anglican Parish. So, my early guesses were close. Of interest, one of the results gave me conflicting information. Below is the image in question. 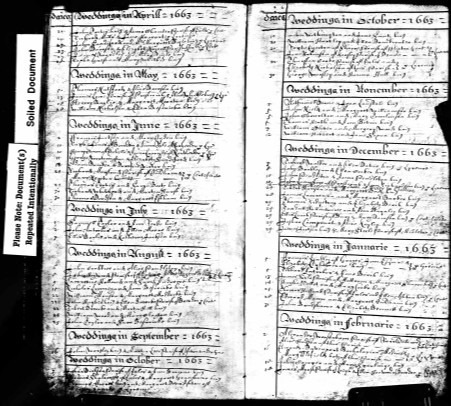 Anglican Parish Registers (Lancashire, England), Lancashire, England, Baptisms, Marriages, and Burials (1573-1812), Burial Record for Edward Worthington, buried 08 May 1629, image 259, accessed 25 Apr 2013; digital images, Ancestry.com. 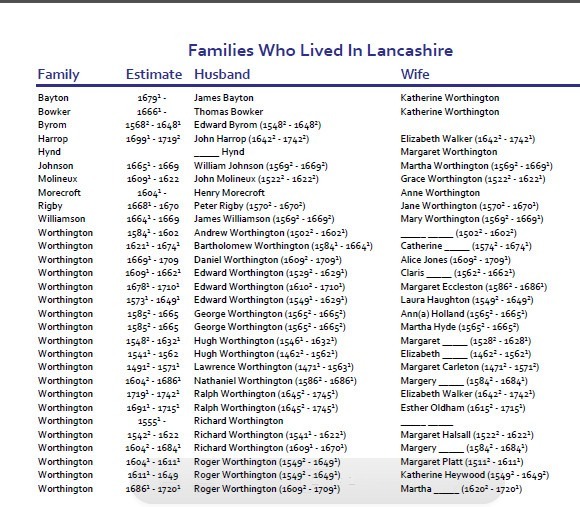 The conflict is that there are two people, in the Pedigree Chart, Edward Worthington, and the chart said that they died “1629”. So, which Edward Worthington is this record for? I am guessing that solely looking at Church Records may present miss leading information. Without any indication of relationships or other information, may lead us to incorrect conclusions. What I did was to enter the SAME record to both people, with a citation, but marked a To Do List task, to resolve this conflict. I also send an email to the project coordinator for additional help, as they have information that I do not have. Bottom line here, the GenDective report has been very helpful. Continuing my research for this “ancient” family line, where should I start to look? 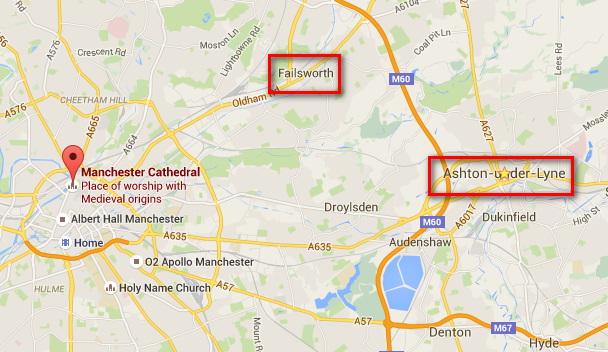 The first record that I found was a marriage record in an Anglican Parish in Manchester, Lancashire, England. The Record group covered 1573-1812. Perhaps there are other records that I might find there, since the collection was for Baptism, Marriage, and Burial’s from that parish. Back to GenDective­™. 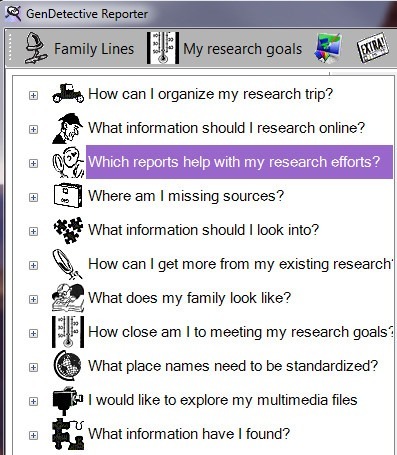 In GenDective Reporter, there is a listing for “Which reports help with my research efforts?” That sounds like what I am looking for. Clicking on the “+” sign, I see a report that might be helpful. Families who lived in state. 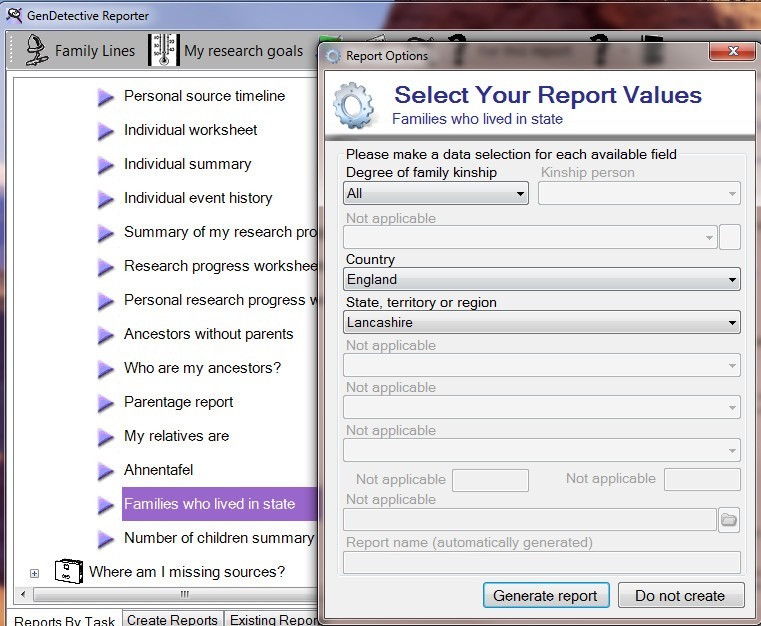 I selected ALL “Degree of family kinship”, Country is England, and State, territory or region, I selected Lancashire and clicked on Generate Report. This generated a report of 30 people who had an event in Lancashire. Looking at the report, which included Dates, I might find any one or all of them in that area of England. So far, with that first “hint” there have been not helpful hints. Because I have so few dates, the hints are not “my person”. So back to Ancestry.com AND FamilySearch.org, as they have Church Records from that area in that time frame. But, at least I can focus on this group of people (30). 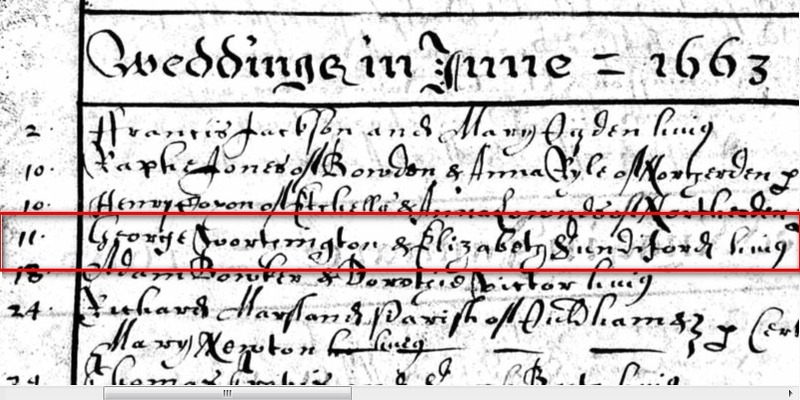 From a hint, on Ancestry.com, I found a marriage record for George Worthington and Elizabeth Sandiford and their marriage of 11 jun 1663 in Manchester, St Mary, St Denys and St George, Lancashire England. All I started with was that George had died between 1669 and 1670. 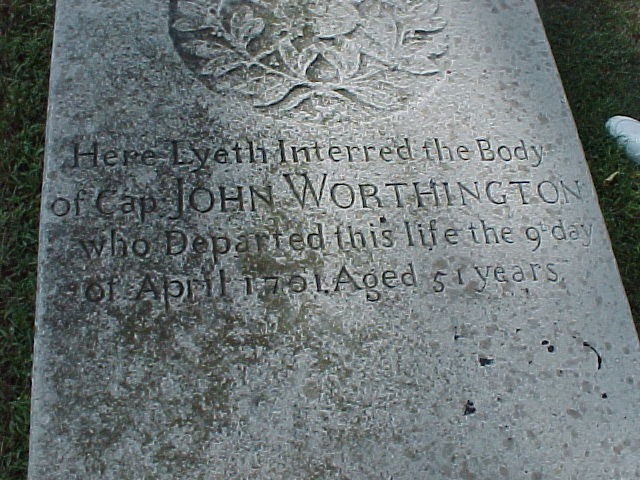 Elizabeth (Sandiford) Worthington was still living in 1669 and that they had been married about 1663. That hint took me to the IMAGE of that record. 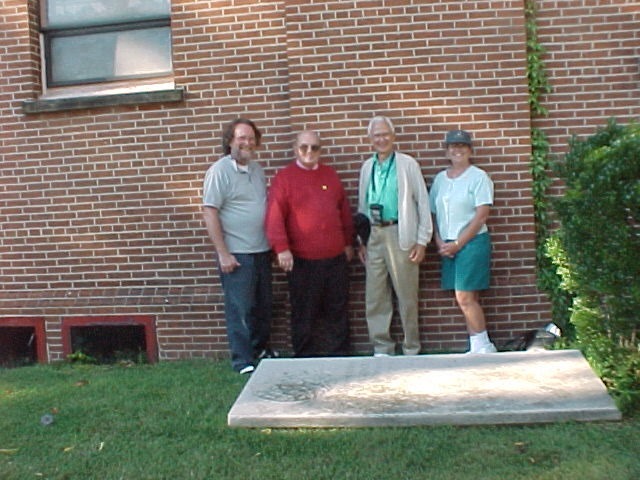 Ancestry.com, Manchester, England, Baptisms, Marriages and Burials, 1573-1812 (Cathedral) (Provo, UT, USA, Ancestry.com Operations, Inc., 2013), http://www.ancestry.com, Database online. More on this project later.